A Block Magic workshop for pre-service teachers was organised by the project members from the University of Barcelona on November 14. 2013. The 24 participants were given a short presentation about the project in general, the development of the various prototypes and the different cycles of evaluation. The participants tried out the newest release of Block Magic in groups of 4-5 people. They used the system first as students playing the various exercises. They were asked to discuss what competences each exercise stimulates, evaluate the the positive and negative aspects of a classroom usage of Block Magic and suggest possible improvements. 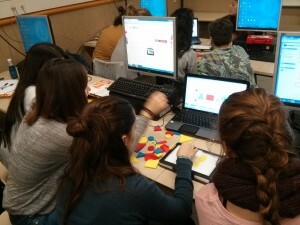 Furthermore, the participants used the Block Magic as future teachers. 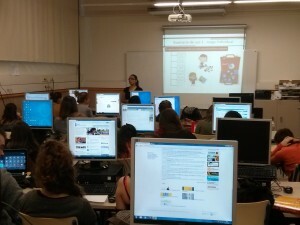 They tried the functionalities related to setting the pedagogical objectives, reviewed the way students’ profiles are displayed and the data that is collected by Block Magic. Each group discussed briefly the advantages of the tracking approach and the students’ assesment it allows.